When it comes to writing eBooks, there are many advantages for a writer: creative freedom, faster time to publication, a global market, higher royalty share, and low risk. You can write an eBook to establish your expertise, write one about a topic you love, or use an eBook as a free giveaway. It may surprise you (as it did me!) that eBooks have been around for a while. Spanish teacher and inventor Angela Ruiz Robles pioneered the first electronic book reader, la Enciclopedia Mecánica in 1949. The electronic book medium took off in the early 21st century, thanks to the ever-present Internet and proliferating e-Reader products. But even with a longer-than-expected history and the many benefits associated with eBooks, you may wonder if this is a format you should pursue and if so, how to go about it. 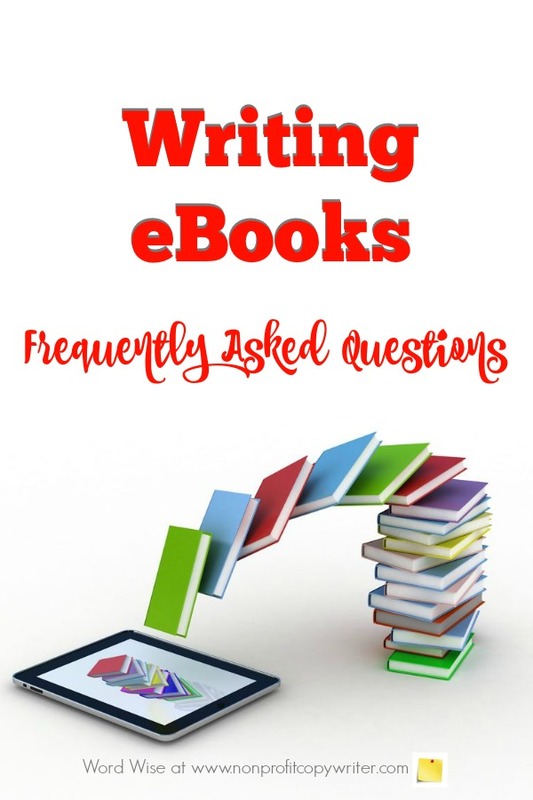 These frequently asked questions about writing eBooks may help. An eBook (“electronic book”) is a book in digital form. It can be formatted for a tablet, Kindle, iPad, cell phone, e-Reader, computer, or other electronic device. You can publish an eBook yourself or you can pay a provider to format and publish your manuscript into an electronic format. Q. How long is an eBook? Length is one big advantage of the eBook format over a traditional print publication. While print books need to be a certain length so that the consumer doesn’t feel cheated and so that the publisher’s investment provides results, eBooks can be short. People like quick reads. Q. What do you need to write an eBook? Q. Writing and publishing are two different things. What do you need to publish an eBook? A computer and a little bit of know-how about editing, formatting, and publishing your eBook to an online platform – know-how that’s readily available. Q. What kinds of content are published in eBooks? All kinds, including both fiction and nonfiction: novels, novellas, short stories, how-to guides, curriculum, textbooks, special reports, checklists, toolkits, workbooks, cookbooks, collections … if you can write it, you can publish it in an eBook. Q. How long does it take to publish an eBook? Even if you have a steep learning curve, eBooks are considered to have a much, must faster timeline to publication than traditional print books. Q. How much does it cost to write and publish an eBook?